Thanksgiving is always the last Thursday in November. The day after, known as “Black Friday” is when the official Christmas shopping season begins. For me, Thanksgiving is about spending time with the people you love, and eating a lot. If your family is like mine, some one may even throw an ashtray at some one else’s head on Thanksgiving. Since my family is 15,000 kms away, I invited all my friends and colleagues over to celebrate with me. I started cooking on Tuesday. This involved baking 2 loaves of wholemeal bread to be used for stuffing the turkey. Also I peeled, steamed and mashed the pumpkin for the pumpkin pie. On Wednesday I made the pumpkin pie, sliced and toasted the bread for the stuffing, and started brining the turkey. This is actually my pumpkin pie from last year. But it looked like this again this year. Several people have requested the recipe for this pie. I have posted it before, but here it is again! On Thursday I prepared the stuffing, stuffed the turkey, roasted it, made the cranberry sauce, and also whipped up some jalapeno corn bread muffins and some guacamole. The turkey, in all its beautiful glory. I used Alton Brown’s brining & roasting instructions, and it was perfect. Last year I followed the Joy of Cooking’s brining recipe, and found that while the bird was good, the drippings were way toi salty to be used for gravy. 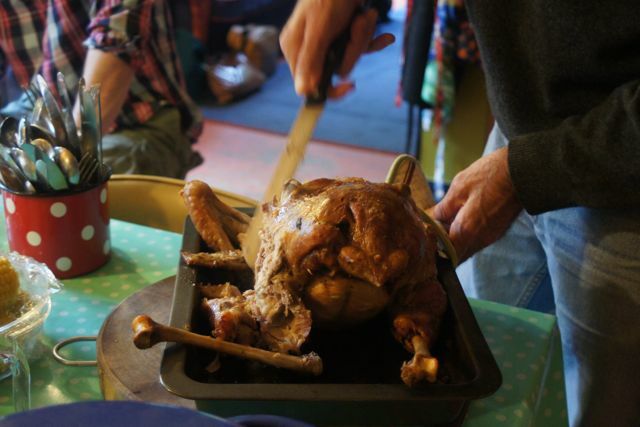 On the other hand, Alton’s recipe produced an amazing bird and delicious gravy! 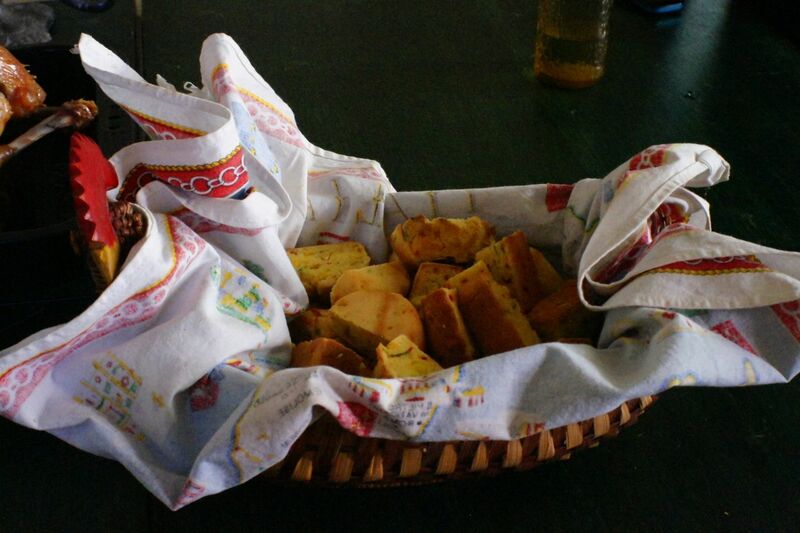 I used Emeril’s recipe to make these cornbread muffins, but left out the cheese because I didn’t have any! I used jalapenos that I grew from seeds last summer, and had been in the freezer for a few months. They were spicy! I didn’t have any cilantro so this guacamole was just mashed up avocado, chopped tomato and spring onion, some diced Thai chillies, salt, pepper, lemon juice, and minced garlic. A little bit of cumin adds a nice Mexican dimension. 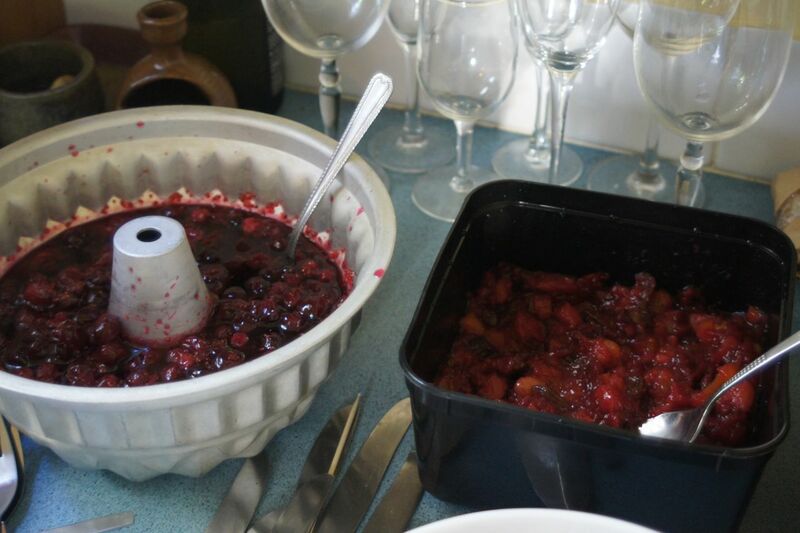 My cranberry sauce (on the left) is basically straight out of the Joy of Cooking. 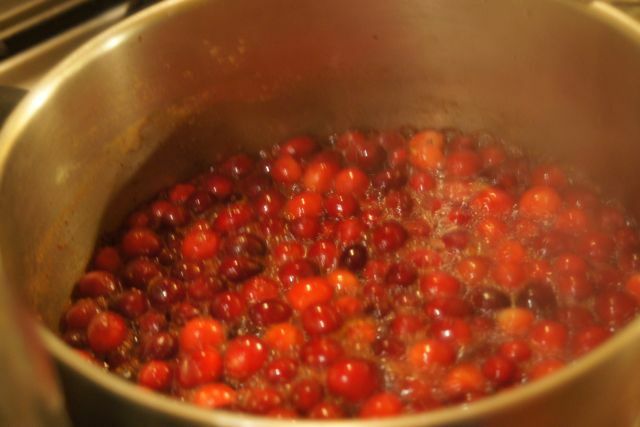 I was multi-tasking a bit too much and couldn’t keep my eye on how long it had boiled… so I took it off the heat before it had reached the right consistency, and I ended up with very runny liquidy cranberry sauce. 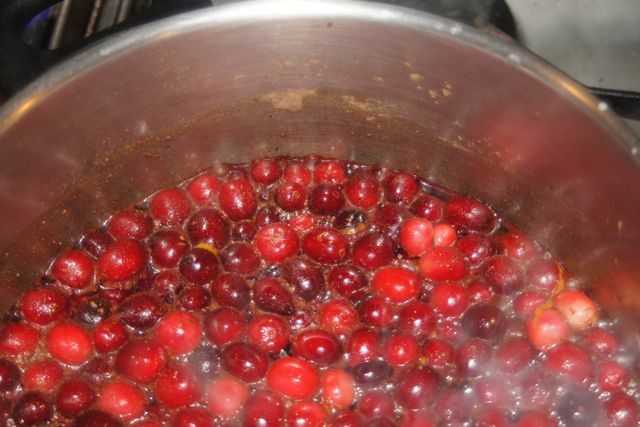 Brady’s cranberry sauce, on the right, is much more jellied and apparently Rachel Ray’s recipe, and I think it had grapes in it. Both were made with frozen Sujon cranberries. Since I didn’t have enough containers to hold all the leftovers, I combined the two in the end and now I have over 1 litre of cranberry sauce in my freezer. Of course, what Thanksgiving would be complete without some classic American junkfood? 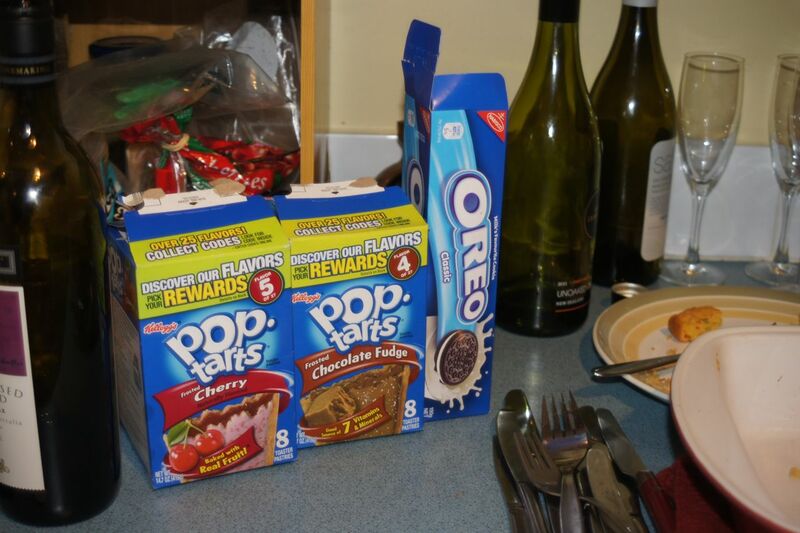 Thanks to Caroline and Brady for bringing Poptarts and Oreos. Also on the table was a really nice platter of fried rice courtesy of Xai & Vahn, some Malaysian rice noodles and agar agar cakes from Rashidah, a salad from Aien, an amazing green bean casserole from Marta, pecan pie from Grant, mashed potatoes from Alice, corn on the cob from Annalise, cheese and salami from Remy, and my special gravy from the turkey drippings. The thing that makes the gravy special is that I put some white wine in it. 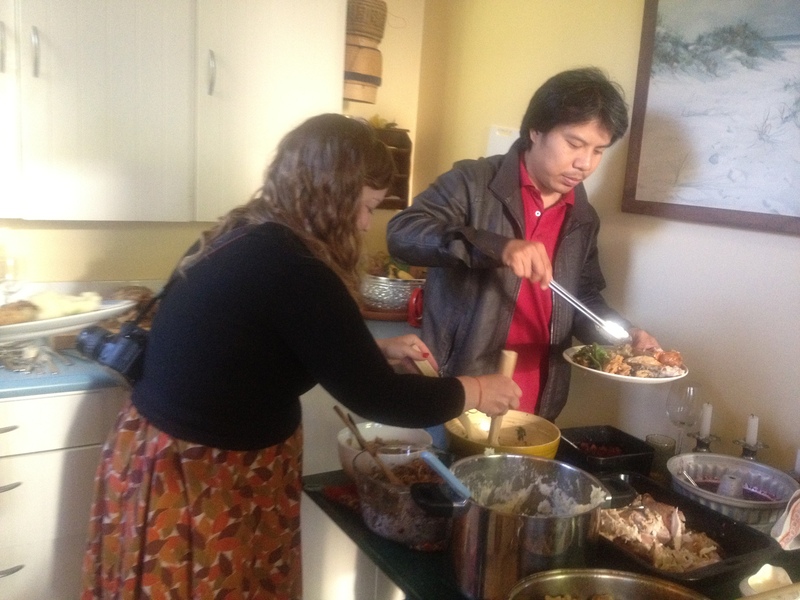 Overall it was a splendid Thanksgiving full of wonderful people and wonderful food, well worth all the effort. 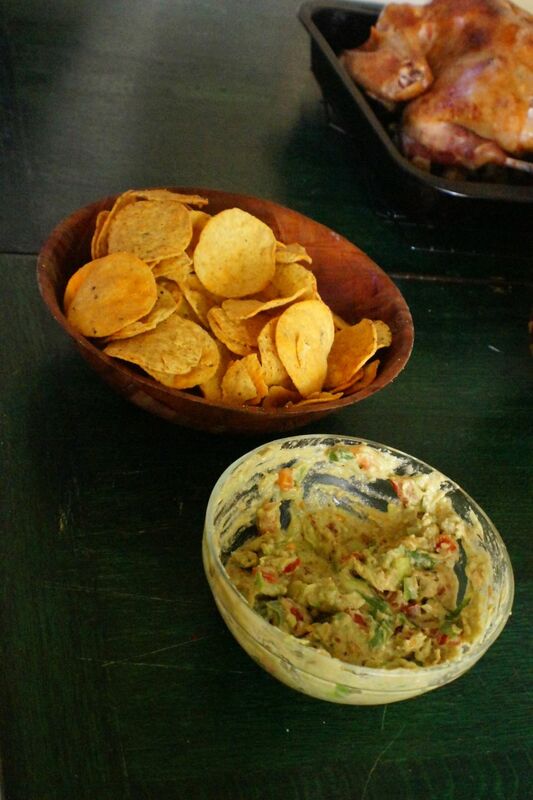 There were quite a bit of left overs, which I have been trying to use creatively. Dice up the zest of 1 lemon, add to pot. Bring to a boil, lower heat, simmer until fennel is tender but not mushy. Add 1/2 cup white wine, juice of 1 lemon, salt, pepper, diced chili, and the brown rice and simmer for 1 or 2 more minutes. Garnish with some fresh parsley or the ends of the fennel. This is probably my current favourite soup, which I usually make with veggie stock and no turkey, especially when I find beautiful fresh fennel at the veggie market. Ok, I am still recovering from Thanksgiving. 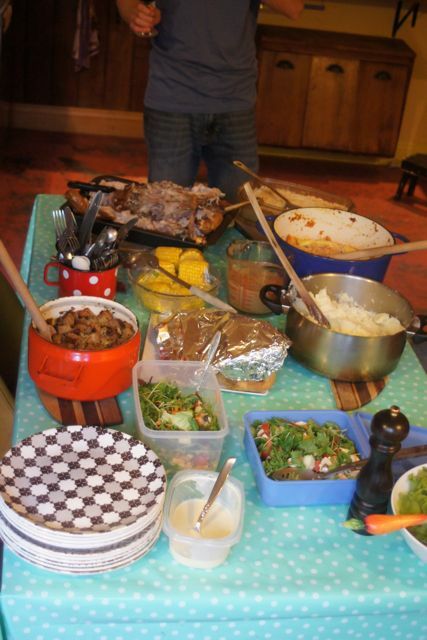 This year it involved over 3 days of cooking and more than 20 people squeezed into my tiny flat. But well worth all the effort. Photos and recipes and other stuff will be coming soon. for the colors and flavors in your laugh and smile. 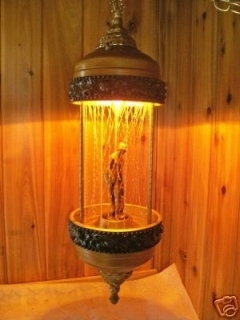 for the food you make from which love and joy warmly shows. for how simple and true you truly are. for how sweet and sunny like honey you are. for all the goodness you are able to gather. for all the words that only famous writers know how to best thank you for moi. One of my goals in life is to bowl a turkey. 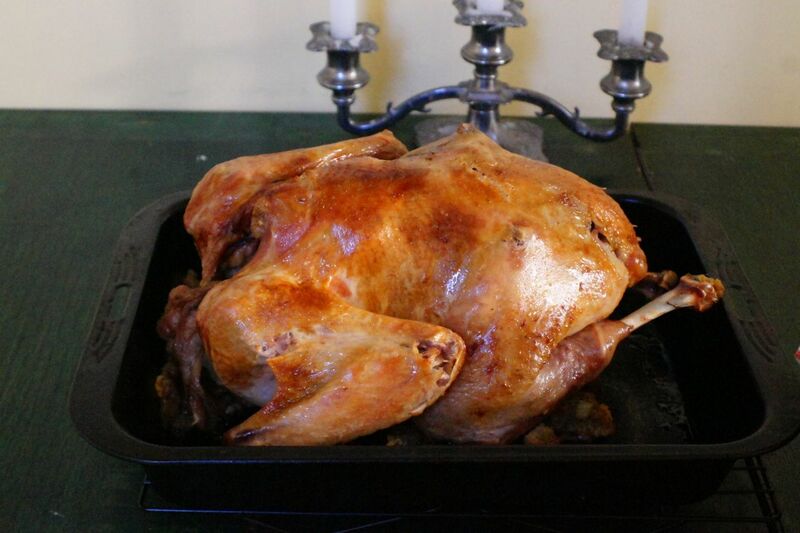 Another goal had been to roast a deliciously succulent moist Turkey. On my last attempt, in February 2010, I failed miserably. However, last week, I finally managed to accomplish this long-sought triumph. I soaked the turkey for about 4 hours in 4 liters of water with 2 cups of salt dissolved in it. It’s important to thoroughly wash the turkey inside and out after brining and before it goes in the oven, or you end up with a very salty bird. The brining some how keeps the turkey moist and flavourful during roasting. The only snag I ran into was that the gravy made from the brined-turkey drippings was waaaaay salty, even watered down with stock and some red wine, it was a bit too much. 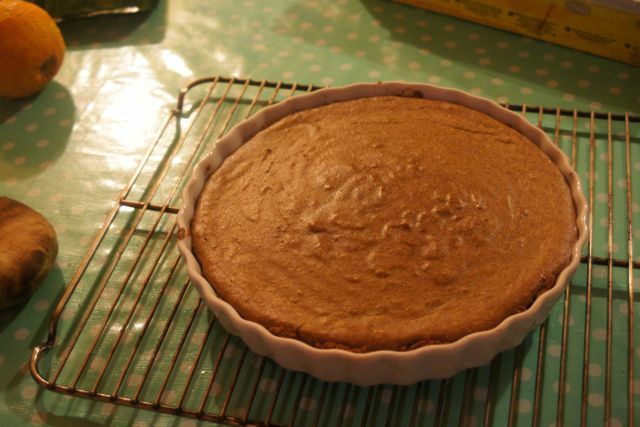 and of course, the pumpkin pie! Though, choosing one of my own favourite dishes is like choosing a favourite child… you have to love even the ones that don’t turn out great (The candied sweet potatoes… with raisins, pineapple, and coconut. Something wasn’t right with that one.). My babies include the turkey, the stuffing, candied sweet potatoes, gravy, and pumpkin pie. Thanks to everybody for bringing such delicious plates – 3 different salads, garlic bread, green bean casserole, corn on the cob, mashed potatoes, apple crumble (not pictured), and pecan pie (not pictured). 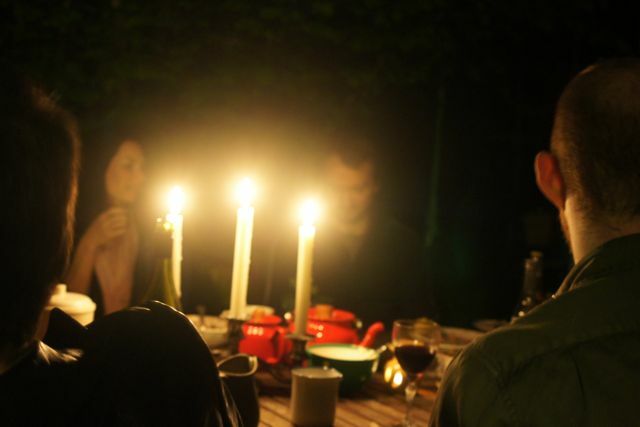 Whether it was a first Thanksgiving or 31st, it was a delicious and lovely evening!